So off we set on our halong bay trip, the bus there took us 3hours so due to lack of sleep the night before we slept most of the way, i woke up briefly to introduce us all (they were doing introductions around the minibus). At noon we arrived at Halong City docks and boarded our "Junk", the boat which was to be our home for the next few days, the boat was really nice, only a few months old. It had a great sunbathing deck on top where we sat after lunch but unfortunately it was quite overcast. Instead we sat and chatted to our group, 21 of us in total, and discovered we were quite lucky as everyone was really nice and friendly. Our boat sailed off then into the bay and we tried to admire the many islands thro the misty-ness. We then arrived at a floating village where we got off and went to see a massive cave, it was really cool (even better than Alliwee caves....i swear!) Afterwards we hopped into kayaks and got to kayak around the bay for a while, we were taken to a grotto which is basically just a bit of the lake enclosed by some of the islands/stacks. After all that excitement it was back on the boat where there was time for a swim before dinner, after seeing all the rubbish the village people were dumping in the bay and due to it being so overcast we gave this a skip and most of us instead bought some drinks and snacks off the shop-boats, small boats that would come up to the junk selling oreos and ritz (backpacker staple foods) and bottles of wine and vodka. After dinner these bottles were drank and a kareoke session was started, in the beginning no-one wanted to sing but after a while we had the whole boat roaring into microphones, im sure the other boats parked in the bay that night didn't know what was going on, some sort of torture perhaps! That lasted a few hours and then we the drink ran out and we went up onto the deck again to look at the stars, soon tho it was off to bed as we had a 7am start the next day. Sure enough the cabin door was banged on at 7am and we all met for breakfast bleary-eyed. The boat set off for Cat Ba island the, the only inhabited island of the 2000 or so. We went to see another cave here which was smaller but prettier than the last and then had lunch before setting off to our hotel. We were spending the 2nd night on the island. Once checked in we were informed that the afternoon was free time, since the weather was so overcast the plan to sunbathe was a bit useless and so we wandered around for a while and then met the rest for dinner. After dinner we all headed off to find a bar but were surprised to discover a nightclub instead. This club was full of vietnamese dancing the night away ..... and it was 9pm!! we met our guide Huang there and he told us that everywhere closes at midnight so hence the early start! We watched amused for the rest of the night and even joined them for a while! the highlight had to have been the dance off at about 11pm tho, some westerner joined in even! The club stayed open late....a crazy 12.30am, and then we all hit the sack. The following morning was another early start and this time we were greeted with the rain that had been building for the previous few days. So it was back on the boat for us and we sat inside for the morning, mourning the loss of yet another perfect tanning session! At lunchtime we arrived back at the docks and were back on the bus back to Hanoi. Once there we hopped straight on a night bus to Hue, our next stop. 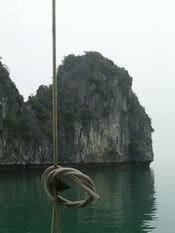 Have to say that the halong bay trip was great but mainly for the group we met, such nice people and we had such fun with them. If the weather had been good and we'd been able to see the stacks properly im sure it would have been excellent. Ive a few photos of it in the Vietnam album on my picasa anyway, ill eventually find a high speed internet and get some photos on this blog!! I swear! !.